When the newly imagined, 25th anniversary production of Les Misérables blew into the Hobby Center, shaking the rafters and bringing the audience to an almost simultaneous standing ovation Tuesday night, a small, snarky part of me wondered if we were cheering for the cast, the show – or our own love of the show. 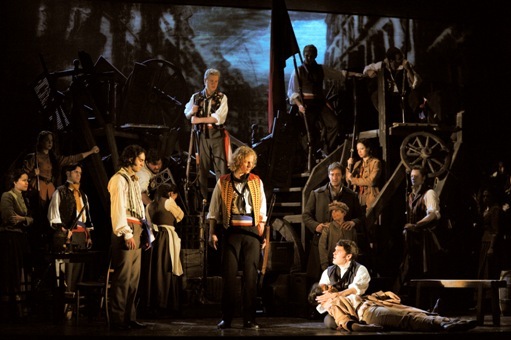 Twenty-seven years ago, Les Misérables swept across the earth with towering music, a cast of seeming thousands, and a production scale that made audiences collectively gasp at its scope. This is a show that broke records, launched careers and caused rock-concert-like lines around theaters all across the globe. It is still the world’s longest-running musical, a testament to its enduring themes and rich music. This new production keeps all of the elements that give Claude-Michel Schonberg and Alain Boublil’s send up of Victor Hugo’s classic tale of love and redemption its real soul – but the new staging takes something away that made it gusty and grand. Anyone who’s ever seen Les Misérables will notice immediately –and likely miss keenly – the absence of a massive turntable upon which the musical, well, turned. But we’ll come to that. From the very first downbeat, this Les Misérables whisks the audience along in the epic tale of the convict Jean Valjean (Peter Lockyear), imprisoned for stealing a loaf of bread to save his starving sister’s child, and Inspector Javert (Andrew Varela), whose vendetta for Valjean causes him to hunt the man across nearly two decades. At its heart, Les Misérables is about the ripples we make in life, how one life touches another and how love is always the answer, regardless of the question or sacrifice. And Valjean’s life ripples forth to touch so many others: Fantine (Betsy Morgan), a factory girl forced to prostitution; her young daughter Cosette (Lauren Wiley), whom Valjean raises as his own; Marius (Max Quinlan), who wins her love; even the unyielding Javert. The sheer singing talent is superb. Lockyear delivers Valjean’s odyssey from convict to upstanding citizen with humanity and grace, and his poignant moments, such as Act II’s achingly lovely “Bring Him Home” are as affecting as his grim determination to eclipse the clutches of the steadfast inspector. Varela’s Inspector Javert is a force to be reckoned with, especially in his two stand-out moments, Act I’s “Stars,” which sent actual shivers down my spine, and the scene in Act II where he must re-think everything he knows about this prisoner he’s pursued. Quinlan sings Marius with wonderful youth and hope, a distinct difference from any Marius on any recording of the production, where the tendency is toward over-emoting. And the award for realism in performance clearly goes to Morgan, whose Fantine fairly dazzles with the pain of loss. In fact, there’s a much more realistic – and less melodramatic – element to this Les Misérables, and great credit goes to directors Laurence Conner and James Powell for making it so. And therein lies the rub. Much of the production seems watered down, but it’s not the fault of the cast, who are definitely talents to watch. There’s a loss of levels without the turntable, and much of the action feels cramped. The projection screens, inspired by the paintings of Victor Hugo, are stunning and the lighting spectacular (both put to tremendous great use in Act II’s sewer scenes), so tremendous kudos to lighting designer Paule Constable and Fifty-Nine Productions, which realized the screens. But the barricade scenes lack dimension with the turntable gone. If you’ve never experienced Les Misérables, it’s still a musical of great power and great pathos. It thrills and inspires and moves one to tears. It is, after all, a show about who we are: the flawed and the flailing, struggling as best we can to live our dreamed dreams, to climb to the light. It is an anthem to rising above injustice, and about how love and faith are all we leave behind – and all we possibly ever need. You’ll hear the people sing, all right, but I mourn the empty chair at the empty table where this production began. Stark Naked Theatre’s season-opening production of Body Awareness is that hat trick of a production: skillfully chosen, sensitively directed and masterfully acted. It is one quirky bucket of weird that also hints at the universal and timeless with every breath it takes. As directed by Stark Naked co-founder Philip Lehl, Annie Baker’s comedy-drama about life in a small New England college town serves up one juicy surprise after another. Since all the characters are smart and witty, that means all Baker’s dialog gets to be those things too: a largely unforced series of scenes that usually put any two of the play’s four characters in a room to talk about stuff, punctuated by the public comments of one character, an extremely “liberal” college psychology professor introducing guests at the school’s annual Body Awareness Week. That character alone is worth the price of a ticket, since she’s forced by her job to talk about human history and relationships even though she seems morally outraged by virtually everything that happens within them. Still, miraculously, the character is neither 100% cartoon nor entirely unlikable. So… the college professor Phyllis (played wonderfully by Pamela Vogel) is a lifelong lesbian in a committed relationship with Joyce (Kim Tobin), a high school teacher who was married earlier, giving birth to a son. That son Jared (in a remarkable performance full of tics, outrage and hilarious non sequitors by Matt Lents) seems quite a handful, since he lives in the house with them at age 21 and may or may not have a condition called Asperger’s, indeed may or may not be what he invariably calls a “retard.” Still, things work more days than not – until, in that grand Chekhovian tradition, somebody else shows up. Frank, a good-looking straight man with a wicked wit and no small ability to cut through carefully orchestrated BS, shows up with his photography exhibit for Body Awareness Week and even stays at the women’s house. Unfortunately for all this chemistry, Frank takes black-and-white pictures of naked women, ranging from girls to senior citizens. Joyce declares the photos beautiful, liberating and clearly, from early on, fantasizes about posing for him. Phyllis, predictably, sees every act of exploitation of women and other minorities since time began in every snap of Frank’s shutter. Body Awareness seems to understand and even like each of its four characters. Drake Simpson fills Frank’s shoes with particular skill, letting us believe he might be a pervert or at least might be doing something perverted. Yet he’s smart, charismatic and exactly, at times, what Jared needs more than anything, a real live actual male. The pivotal scene in which Frank tells Jared what he needs to do to grow up is wildly off-color, hilarious and true. The fact that a woman wrote these lines makes it her own nuanced but angry plea after no doubt meeting and/or dating “boys” who have refused to do so. As in Chekhov, there may or may not be anything life-changing happening within this play’s uninterrupted 90 minutes, all made painless to watch by sets and props by Jodi Bobrovsky and lighting by Clint Allen. It’s the little moments that seem to matter in Body Awareness, the little shifts and temporary standoffs, that mark our race’s wobbly stumble toward being, and occasionally even acting, human.